I was just reading some of the items in the HEXACO measure of personality. It seems to me that the "honesty-humility" factor is actually more naturally expressed in the opposite way. I.e., about three quarters of the items are reverse scored. For example, items measuring fairness (i.e., reverse coded) tend to focus on a willingness to engage in corrupt or even criminal behavior to advance your self-interest. Items measuring greed avoidance seem to be focused on concern with social status grounded in superficial things. Modesty items seems more like a measure of narcissism (i.e., believing you are better than others in some essential and vague way). Sincerity seems to have items concerned with a willingness to engage in social manipulation through flattery and guilt. This got me interested in the correlation between honest-humility and the dark triad: machiavellianism, narcissism, and psychopathy. What are the best estimates of the correlation between HEXACO honesty-humility (and facets) with the Dark Triad? A few studies have directly examined the relations of the Dark Triad with the Honesty–Humility factor (as operationalized in the HEXACO Personality Inventory [–Revised]; HEXACO-PI[-R]). These investigations have found the low pole of the Honesty– Humility factor to be essentially identical to the common elementof the Dark Triad variables (Lee & Ashton, 2005; Lee et al., 2013). One study I found by Aghababaei et al (2014) reports the following correlations for 223 employees using 12 item dark triad and 60-item hexaco. Of course, this is not the ideal study for facet-level measurement of honesty-humility. Ideally, you'd want more items both for facet-level measurement and measurement of each of the dark triad in order to get a broad and reliable measure. But it should give some idea. Aghababaei, N., Mohammadtabar, S., & Saffarinia, M. (2014). Dirty Dozen vs. the H factor: Comparison of the Dark Triad and Honesty–Humility in prosociality, religiosity, and happiness. Personality and Individual Differences, 67, 6-10. There's now a meta-analysis by Muris et al. (2017) which is a little more fine grained because also takes into account intercorrelation between these three; i.e. Muris et al. report effect sizes both uncorrected and corrected (for shared variance). As anticipated, the relations between honesty-humility and the dark triad traits were all negative and of a moderate to large effect size. Thus, in general, narcissism, Machiavellianism, and psychopathy are associated with low levels of positive attributes such as truthfulness, honesty, fairness, sincerity, and faithfulness, which is not surprising as each dark trait can be described in terms of the precise opposites of these characteristics (Ashton et al., 2000). As can be seen in Table 3, the negative link with honesty-humility was significantly stronger for Machiavellianism and psychopathy than for narcissism (rs being -.61 and -.54 versus -.41, respectively). This was especially true for the facets of sincerity and fairness, which were more strongly negatively linked to Machiavellianism and psychopathy, but not for the facet of modesty, which was more substantially negatively associated with narcissism. Thus, Machiavellianism and psychopathy are primarily related to dishonesty and falsehood, whereas narcissism is predominantly linked to arrogance and haughtiness (e.g., Aghababaei, Mohammadtabar, & Saffarinia, 2014; Jonason & McCain, 2012). 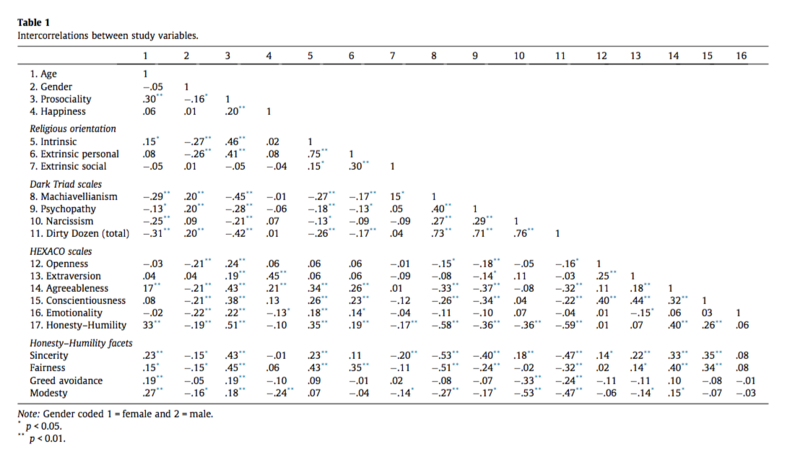 When controlling for the shared variance among the dark triad traits, we found a similar picture (see lower panel of Table 3). That is, narcissism was positively associated with extraversion and openness, Machiavellianism was negatively related to agreeableness, and psychopathy was negatively linked to agreeableness and conscientiousness. All dark traits remained statistically negatively associated with honesty-humility (with narcissism being more clearly connected to lack of greed avoidance and modesty, and Machiavellianism and psychopathy being more convincingly associated with lack of sincerity and fairness). Yet, controlling for shared variance resulted in attenuated effect sizes (i.e., uncorrected rs between -.41 and -.61 vs. corrected rs between -.26 and -.40). 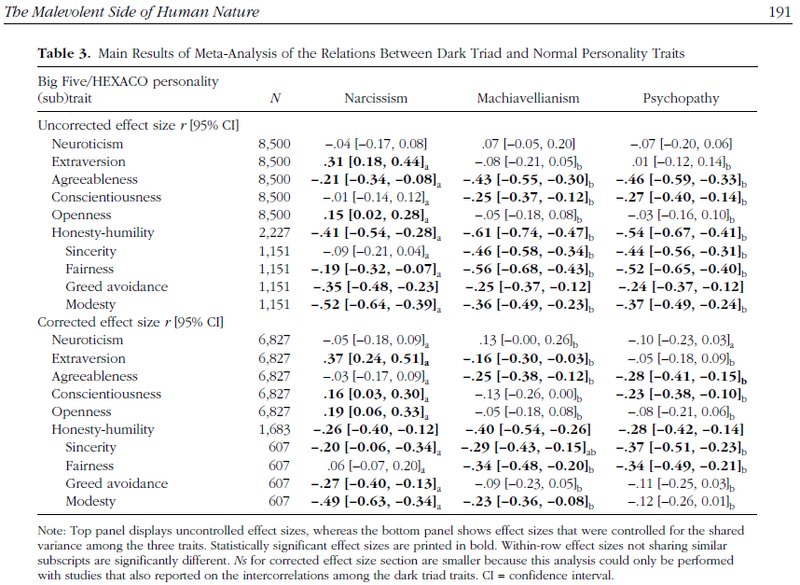 Two new relations attained statistical significance once we controlled for the shared variance among dark triad traits: Machiavellianism was negatively associated with extraversion (r = -.16), while narcissism was positively related to conscientiousness (r = .16). We can only speculate about the meaning of these relations. Thus, the lower levels of extraversion in Machiavellianism fit with the often covert manipulations that are thought to be typical for this trait. The relatively higher levels of conscientiousness that accompany narcissism may serve the effective pursuit of admiration from others. They also point out that MACH-IV (ODTS) had a small positive correlation with neuroticism, but this becomes negative with SD3, which they could not really explain other than by "employment of different instruments". What are the correlations between HEXACO and NEO-PI factors?